Eagle Ridge GM | Blog | What’s New with the 2018 Chevrolet Colorado? What’s New with the 2018 Chevrolet Colorado? 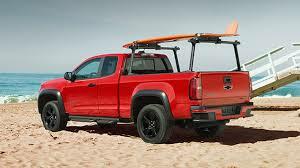 The Chevrolet Colorado represents the reawakening of the mid-size pickup segment in North America. 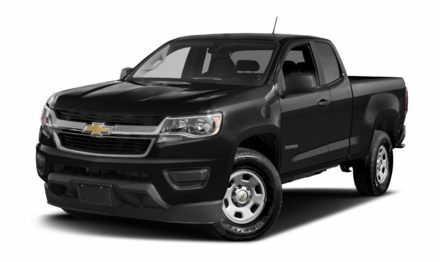 Its innovative features and handsome design features help make this gritty and refined pickup a viable alternative to much larger, more expensive, and less efficient utility vehicles while maintaining a dedication to comfort, power, and practicality. The 2018 Chevy Colorado comes with three available engine options that range in practicality, power, capability, and even fuel sources. The standard 2.5L four-cylinder engine offers best-in-class 4-cyl power at 200 horsepower, as well as best-in-class torque at 191 lb/ft, and a towing capacity of 3,500 pounds. The little inline-4 also boasts impressive fuel efficiency of 9.2L/100km highway. Next is the available 3.6L V6 which offers best-in-class horsepower at 308HP, best-in-class torque at 275 lb/ft, and a beefy towing capacity of 7,000 pounds an average fuel efficiency rating of 9.6 sipping L/100 km highway. Last is the Colorado’s pièce de résistance, an innovative and powerful available Duramax 2,8L turbo-diesel engine rated at 181 HP and best-in-class torque of 369 lb/ft. The diesel is also capable of a best-in-class max towing capacity of 7,700 pounds and an almost unbelievable average fuel efficiency rating of 7.9L/100 km. The 2018 Colorado remains unchanged in the aesthetics department when compared to the outgoing 2017 model. It does, however, offer a plethora of incredibly tasteful, stunning, and capable packages including the Shoreline, Redline, Z71 Midnight, and Custom to round out your options to stand out in the crowd. The fully boxed frame and shear-style mounts translate to a smoother ride on the road, and the Colorado is also the first small truck to feature triple inlaid sealed doors, thicker windshield and side glass windows, and liquid-applied sound deadener to help keep the cabin quiet and refined. The available Bose sound system adds an element of refined audible elegance to the Colorado, and available leather-appointed, heated front seats, an available 8-inch touch screen, and intuitive gauges help create a space of relaxation. The available GearOn storage system brings epic utility and refinement to the Colorado name, with unique two-tier loading and a bed divider to store, organize, and secure your gear. 2018 marks the 100th anniversary of Chevrolet, and to celebrate, the bowtie brand created a special Centennial edition of the Colorado complete with heritage badging, Z71 off road capability, 18-inch wheels, all-weather floor mats with Heritage branding, and a spray-in bedliner with the same Heritage bowtie emblem. This model also comes with an exclusive paint colour, Centennial Blue Metallic to commemorate the feature colour of Chevy’s of old, and to add some colour and class to the 2018 offering. The Colorado ZR2 was built to do one thing: slay trails and every chunk of last off-road terrain it’s introduced to. The purpose-built off roader is a serious tank of a truck, featuring a segment-first Multimatic Dynamic Suspension Spool Valve Shocks, and segment exclusive front and rear locking differentials. Available with either the 3.6L V6, or the 2.8L turbo-diesel, the Zr@ delivers best-in-class torque and a wider track for added stability to get the mighty little truck out of any jam it encounters. Premium interior materials and features help passengers to forget their in such a trail-eating machine. 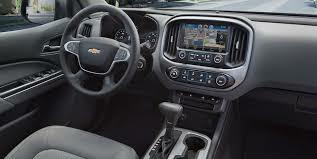 The Colorado now also includes standard Teen Driver Technology with a number of youth-oriented features like muting the audio until front seatbelts are fastened, and automatically turning on specific advanced safety features like forward collision alert notifications and a parent driving report card so you can investigate and check-up on how your teen driver is performing behind the wheel. You want it, and the Colorado is sure to deliver. Offering intuitive safety and tech features, fuel efficiency, a plethora of engine options and inspired design, the Colorado is the perfect choice for drivers who want to experience the freedom of the open road with the help of a reliable and dependable truck that questions pre-described pickup identities and blurs the lines.